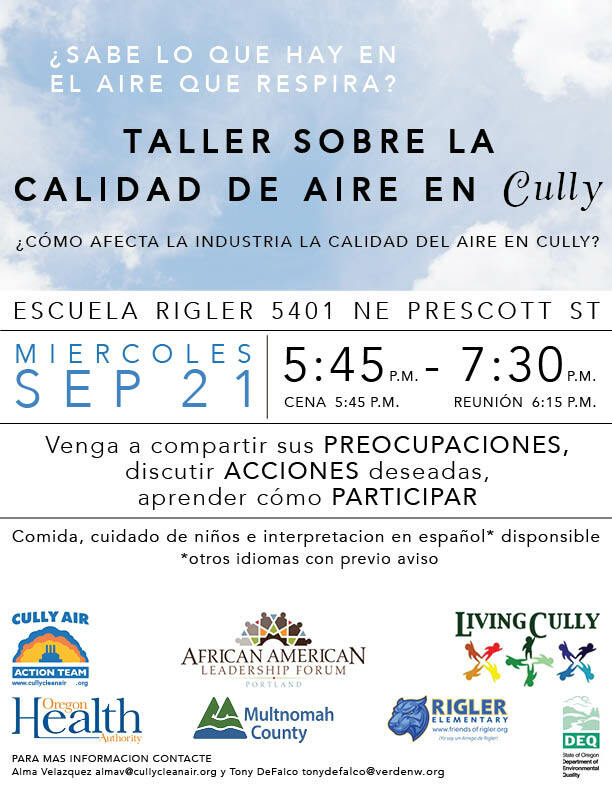 Residents of the northeast Portland neighborhood of Cully gathered this week to share concerns about air pollution from local factories and passing diesel trucks. Becerril volunteers with a local nonprofit that advocated for clean water. 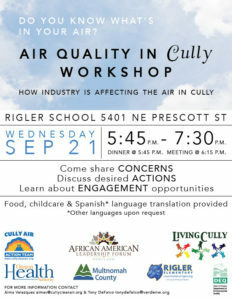 So when she got an email announcing Wednesday night’s meeting about air toxins, she came to find out what what going on. She hadn’t heard about problems with the air. And she wasn’t the only one. 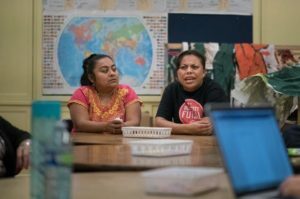 Two women hired for the evening to watch children while neighbors learned about air toxins, joined in. 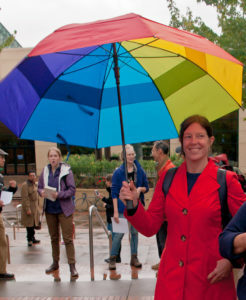 “It’s the first time I’m hearing about this, and I’m worried,” Lleny Ku said. 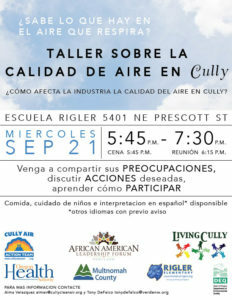 Organizer Alma Velázquez, a volunteer with Cully Air Action Team (link is external), said she grew up in Guadalajara and thought you could tell if the air was polluted by the color of the air. 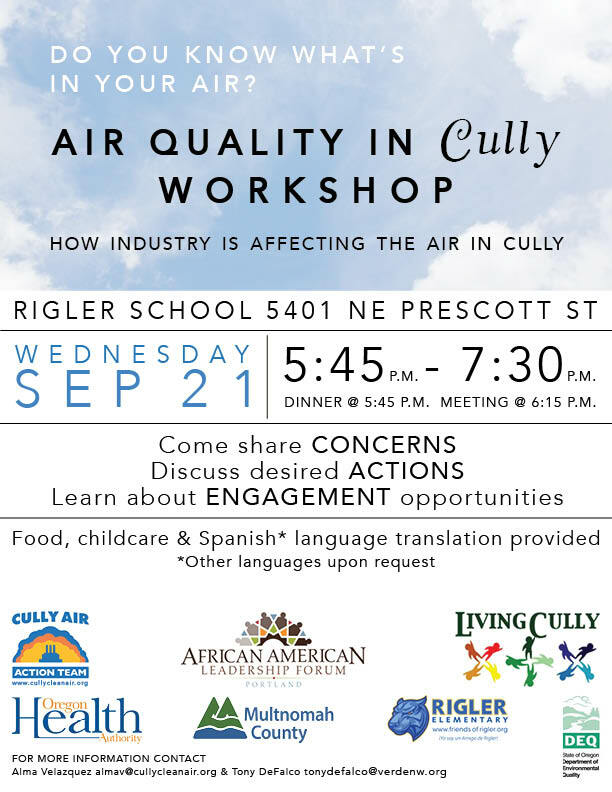 So when she learned about possibly unsafe levels of arsenic and cadmium near glass companies in other parts of Portland, she began organizing neighbors for a formal study on the air in their neighborhood. As neighboring states tighten regulations on dirty emissions, Oregon has become a dumping ground for older model semi trucks. That’s a big problem for people in Cully, where a major transport route borders the neighborhood to the North. Glass and asphalt companies operate nearby, along streams and ponds marked with signs warning of polluted water. Mirexa Acosta said she hadn’t known about the companies, but she’s not surprised. Sometimes when she walks outside, the air smells like chemicals that remind her of pesticide spray. “We’re not informed about anything,” she said. She’d like to know how to complain. 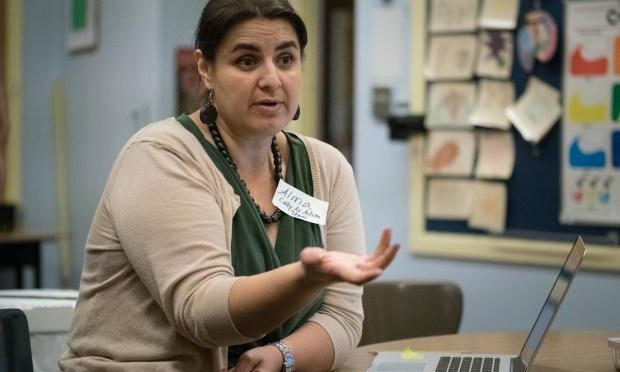 Nina DeConcini, a regional administrator at the state’s Department of Environmental Quality (link is external), told Acosta and the other attendees that the agency wanted to hear from them, and would respond to concerns with inspections and studies. The state, for example, recently installed two air monitors in the neighborhood. They expect results will be ready this fall. Lleny Ku (left) and Mirexa Acosta were startled to find out about potential problems with the air quality in Cully. Matt Hoffman, a program specialist with Multnomah County Environmental Health, said the county has little control over factory emissions, but it’s looking at how to limit traffic from old diesel trucks that use county roads.